A new dry adhesive loses no traction in the cold and becomes stronger in extreme heat. 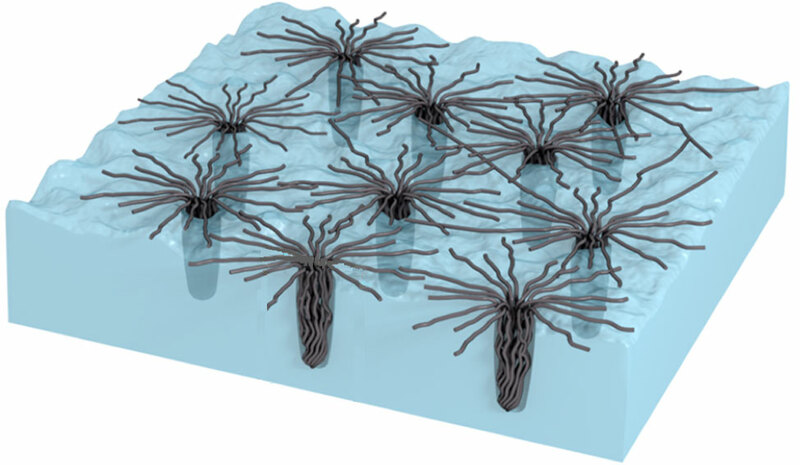 Here’s how: Bundled nodes of carbon nanotubes penetrate surface cavities and form web-like structures likely adding to the van der Waal’s attraction. As the surface heats it becomes increasingly rough, and the bundles appear to penetrate deeper, becoming locked into place and further increasing the adhesion. Researchers from Case Western Reserve University, Dayton Air Force Research Laboratory and China have developed a new dry adhesive that bonds in extreme temperatures—a quality that could make the product ideal for space exploration and beyond. The gecko-inspired adhesive loses no traction in temperatures as cold as liquid nitrogen or as hot as molten silver, and actually gets stickier as heat increases, the researchers report. The research, which builds on earlier development of a single-sided dry adhesive tape based on vertically aligned carbon nanotubes, is published in the journal Nature Communications. As far as the researchers know, no other dry adhesive is capable of working at such temperature extremes. Liming Dai, professor of macromolecular science and engineering at Case Western Reserve and an author of the study teamed with Ming Xu, a senior research associate at Case School of Engineering and visiting scholar from Huazhong University of Science and Technology; Feng Du, senior research associate in Case Western Reserve’s Department of Macromolecular Science and Engineering; and Sabyasachi Ganguli and Ajit Roy, of the Materials and Manufacturing Directorate, Air Force Research Laboratory. Vertically aligned carbon nanotubes with tops bundled into nodes replicate the microscopic hairs on the foot of the wall-walking reptile and remain stable from -320 degrees Fahrenheit to 1,832 degrees, the scientists say. Because the adhesive remains useful over such a wide range of temperatures, the inventors say it is ideally suited for use in space, where the shade can be frigid and exposure to the sun blazing hot. In addition to range, the bonding agent offers properties that could add to its utility. The adhesive conducts heat and electricity, and these properties also increase with temperature. “When applied as a double-sided sticky tape, the adhesive can be used to link electrical components together and also for electrical and thermal management,” Roy said. In testing, a double-sided tape made with the carbon nanotubes (CNTs) applied between two layers of copper foil had an adhesive strength of about 37 newtons per cm-2 at room temperature, about the same as a commercial double-sided sticky tape. Unlike the commercial tape, which loses adhesion as it freezes or is heated, the CNT adhesive maintained its strength down to -320 degrees Fahrenheit. The adhesive strength more than doubled at 785 degrees Fahrenheit and was about six times as strong at 1891 degrees. Surprised by the increasing adhesive strength, the researchers used a scanning electron microscope to search for the cause. They found that, as the bundled nodes penetrate the surface cavities, the flexible nanotubes no longer remain vertically aligned but collapse into web-like structures. The action appears to enhance the van der Waal’s forces due to an increased contact surface area with the collapsed nanotubes. The adhesive held strong during hundreds of temperature transition cycles between ambient temperature and -320 degrees then up to 1891 degrees and between the cold extreme and ambient temperature. Copper foil, which was used for many of the tests to demonstrate the potential for thermal management, is not unique. The surface of many other materials, including polymer films and other metal foils, roughen when heat is applied, making them good targets for this kind of adhesive, the team suggests. This work is mainly supported by the Department of Defense Air Force Office of Scientific Research Multidisciplinary Research Program of the University Research Initiative and the National Science Foundation.